MP Anoulack Chanthivong says his Stop the Squeeze survey has a clear message for the state government: no more development until we get the infrastructure. Residents in the Macquarie Fields electorate have sent an overwhelming message to the Liberal State Government: it’s time to stop the squeeze. 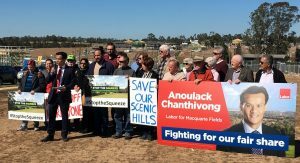 That message forms the basis of a report launched yesterday by Macquarie Fields MP Anoulack Chanthivong detailing the results of a survey in which thousands of constituents made it clear that overdevelopment is out of control. “Emphatically, 98 percent of respondents said they have had enough of development in their suburb and 96 percent think developers have too much power,” Mr Chanthivong said. “The message to the Liberal State Government is clear – stop turning our local area into a developers’ dumping zone for more congestion, more high rises and more urban splatter at the expense of our community’s character. Mr Chanthivong said every household in his electorate received a copy of the Stop the Squeeze survey, with thousands of people providing feedback on how they feel about development in their area, what they fear about overdevelopment and how important it is to them to save our green open spaces and maintain our suburban charm. Residents nominated loss of green open space, traffic and general overcrowding as their top three concerns about overdevelopment. “Residents feel our area is bearing the brunt of development – it’s unfair and they want it to stop,” Mr Chanthivong said. Mr Chanthivong said residents wanted to see firm action on infrastructure before more people moved into local suburb. “The scars of the Liberal Government’s poor and inappropriate planning will only result in more stifling congestion; more overcrowding of our trains, schools and hospitals; and more housing developments that squeeze people in while squeezing out the suburban backyard and green open space,” he said. The full Stop the Squeeze report, including suburb-by-suburb results, can be viewed online at www.letsbackanoulack.com. A limited number of hard copy reports are available by calling Mr Anoulack’s electorate office on 9618 2077.